Taking your medications everyday is like finding a dollar. Exercising five days a week is like finding $100. Which would you prefer? Smile and always have a positive attitude. Dr. Aiken is Board Certified in Internal Medicine, he believes that an empowered patient is a healthy patient and invests quality time providing information and listening to patients. 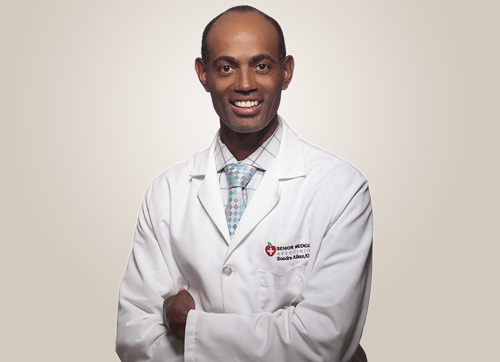 He has a passion for preventative health as illustrated by his efforts to make Jackson Memorial Hospital smoke-free and desire to promote a healthy-lifestyle by providing free weight loss classes to his patients. He extended his passion to the community by forming partnerships with local churches to raise awareness about diabetes prevention through life-style changes. Most recently, Dr. Aiken has led his patients through Diabetes Management and Happy Classes at the Senior Medical Associates Sunrise location. Doctor Aiken realizes that the best teachers lead by showing the way.